Scotland’s stunning victory over England has made something of a mockery of the International Cricket Council’s decision to limit the 2019 World Cup to just 10 teams. England are the world’s top ranked team and they were expected to pulverise their northern neighbours in the clash at The Grange in Edinburgh. But a century from Calum MacLeod inspired the Scots to a nail-biting six-run victory in a thoroughly absorbing contest. It was up there with the greatest sporting shocks of the modern era, but it showed the vast potential of some of the less heralded cricketing nations. Scotland have now beaten England, Sri Lanka, Zimbabwe and Afghanistan in recent months, and Brian claims the country is blessed with the best crop of players it has ever had. As statements of intent go it could not have been more emphatic. The most highly respected betting sites in the world have made England the favourites to win the 2019 World Cup, and Scotland took them apart in a fearless display. 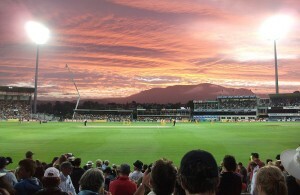 It fuelled further criticism of the ICC’s decision to reduce the number of teams at the competition from 14 to 10 for 2019. Brian said he is “pushing for 16” teams at the 2023 World Cup, and that would make sense as most tournaments feature at least 16 teams. It sounded great on paper ahead of the 2007 World Cup in the Caribbean, with 16 teams divided into four groups, from which two groups in each progressed to the quarter-finals. It is a system that has worked well at many competitions, such as football’s European Championships. It turned out to be something of a disaster, however, as India lost all three group games and were promptly eliminated, hitting the ICC’s commercial revenues hard. Another option would be to take it back to 14 teams and have two groups of seven. Each team would then play six group games, and the winner could go through to the semi-finals. A play-off between the second and third teams in each group could decide the other semi-finalists, and that would ensure a number of games to whip up much needed cash for the ICC. Either way, it seems important to include nations like Scotland in the mix in 2023, as it will be good for the global appeal of the game, particularly among youngsters. MacLeod, Mark Watt and Safyaan Sharif became heroes in Scotland for vanquishing the English last week. Imagine how much that would be amplified if they pulled it off at the World Cup? Involving more countries can only be healthy for the game’s future, and Scotland’s next step would be to secure Test cricket. For England, they have to prove that shocking defeat was a mere blip by thrashing Australia once in the best-of-five ODI series. Nasser Hussain said the team needed a kick up the backside, and MacLeod and co delivered it in style. Now the English need to regroup and build up momentum ahead of the 2019 World Cup, which should be a thrilling spectacle, even without the presence of Scotland.